British Customs profiles innovative custom motorcycle designer Jeremy Lacy of DownShift Studio on small town family values, giving back, being passionately dedicated to a craft, and designing a custom motorcycle to be given away for charity. I get goosebumps when I see a bike or part I helped design come together into a build. Sure, sometimes a design doesn’t work out, and you learn from that. But when it does work, the feeling is amazing. 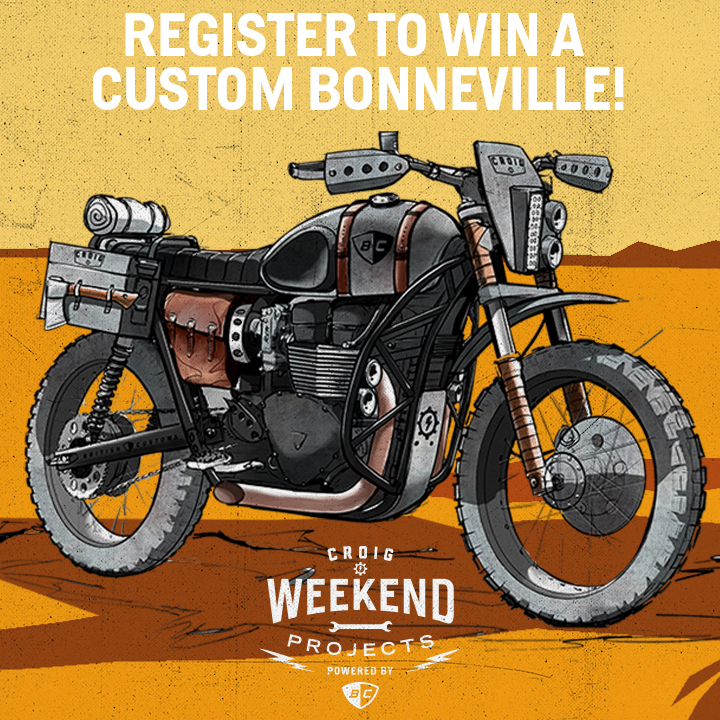 British Customs interviewed and profiled custom motorcycle designer Jeremy Lacy of DownShift Studio on his small town upbringing, giving back, being passionately dedicated to a craft, and designing the Mad Max-themed CROIG X British Customs Edition 2015 Bonneville being given away for charity. Read the profile here. Lacy, based out of Denver, is the founder of DownShift Studio, a design studio for unique custom motorcycles. 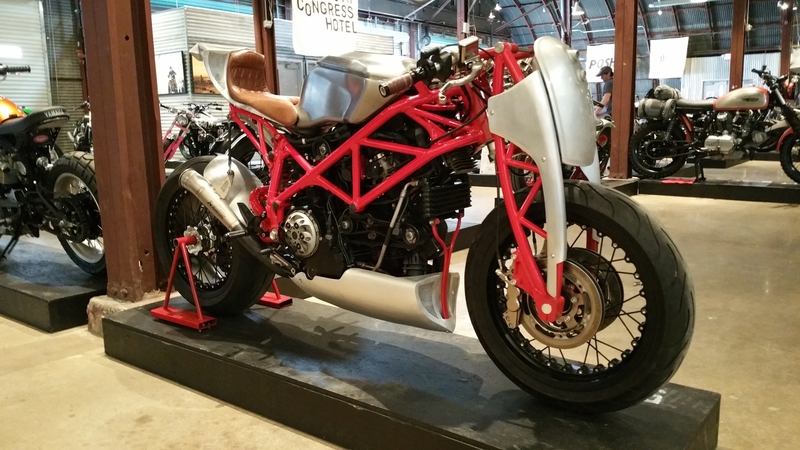 Lacy’s designs have gathered deep respect in the custom motorcycle scene for the motorcycles built from his designs shown at the One Moto Show, the Handbuilt Motorcycle Show, and others. He is a reputed New Heritage designer, one who bridges the past and the present and carries the scene forward with his love for heritage acting as his inspiration. Lacy finds his inspiration in his roots going back to growing up in a small town, being raised to respect the past, and supporting the community by giving back. In his interview, Lacy discusses discovering motorcycles as a child while growing up on his grandfather’s farm, finding a place for himself in industrial design, giving back to the community, and living his passion by designing innovative custom motorcycles. “I get goosebumps when I see a bike or part I helped design come together into a build. Sure, sometimes a design doesn’t work out, and you learn from that. But when it does work, the feeling is amazing,” Lacy stated in his interview. Lacy’s designs have also been used to create motorcycles given away to raise awareness and donations for charities. Lacy’s first motorcycle designed to aid a charity was the Yamaha RD350 built by Wes Case of Threepence, which was built to take on the Trans-America Trail before being raffled off to raise money for the Childhood Leukemia Foundation. Lacy’s latest effort to help raise money for charity is the Mad Max-themed CROIG X British Customs Edition 2015 Triumph Bonneville being built to raise awareness and donations for Riders for Health, a charity that uses motorcycles to deliver life-saving medical supplies and services to communities in rural Africa. 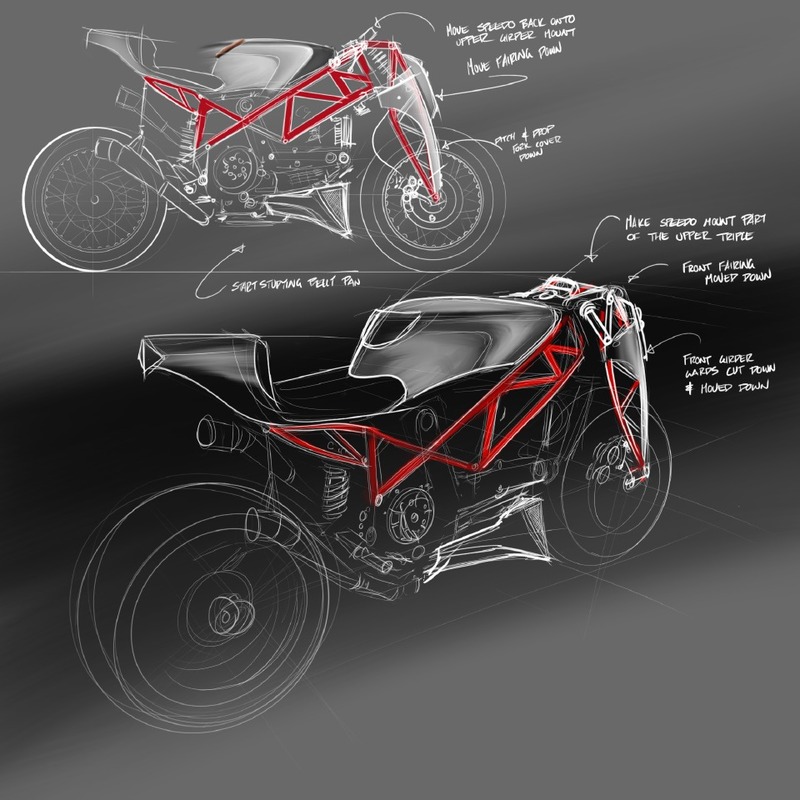 The bike is being built by community voice Cafe Racers of Instagram (CROIG) with British Customs parts to show the possibilities of motorcycle customization with bolt-on parts. Register and donate to win the bike here. 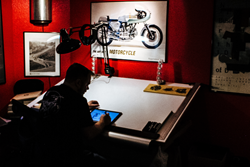 DownShift Studio was founded by Jeremy Lacy, a Denver-based industrial designer who eats, sleeps, and breathes anything and everything motorcycle. His work consists of loose freehand sketches and renderings created using either traditional or digital techniques.